Some of the videos are posted on Facebook (possibly requiring Flash); others are on YouTube. The first batch of videos presented here focus on French dances. Breton dances will be featured in the next post. 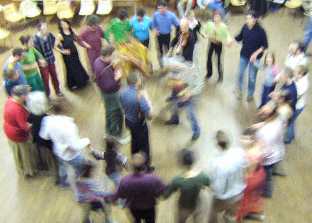 Circassian Circle – same as UK – sometimes even to the same tunes! Fast 3/8 circle bourrée – duo Thebault are from Charantes, so “Poitou” style?